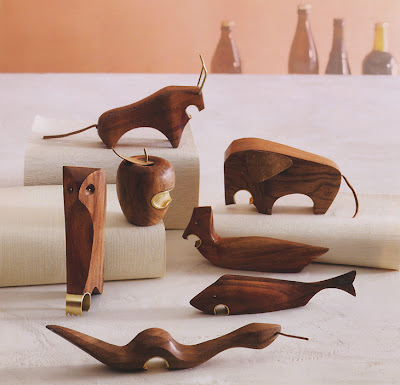 Animali wooden bottle openers. We love functional design so we really are crazy about these Animali wooden figures which were designed as bottle openers and available from nova68. They make really neat gift ideas. These beautiful Animali bottle openers capture the spirit of the mid century modern Scandinavian design movement. These quality wooden bottle openers where inspired by Scandinavian wooden design objects and teak figurines from the 1950s by Kay Bojesen, Kristian Vedel and Skjode Skjern. These attractive wooden creatures are full of personality. This wonderful selection of wooden bottle openers is characterized by its elegant minimalist Scandinavian design style and functionality. Each Animali bottle opener is expertly crafted by master wood artisans in solid hardwood and features brass details and leather trim. Select from either bull, owl, elephant, duck, shark, snake or an apple. Economically priced, these make great gifts for family and friends. And best of all, these whimsical creatures can be put to good use, every day!